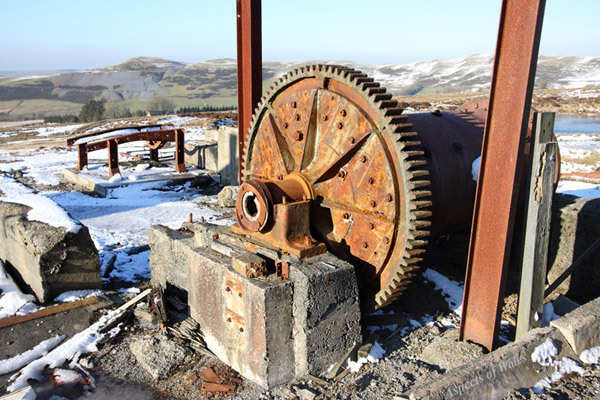 The cylindrical feature in the foreground is a rod mill, which was used to re-process the "tailings" (waste left over from previous metal ore processing) at Esgair Mwyn Mine in the 1970s. Concentrated lead ore (galena) was then extracted from the crushed tailings by flotation. This enterprise was the brainchild of George Hall, who kindly explained to me how it all worked and the many challenges that he had to overcome. The previous mining at this site dates back several centuries, but most production was between 1751 and 1927. In the distance on the left you can see the spoil heaps at Glogfawr Mine on the opposite side of the Marchnant valley, which drains into the Teifi Valley upsteam of Cors Caron/Tregaron Bog. This photo was taken in the afternoon on 1st February 2012 at NGR SN7541569316. Canon EOS 40D, Canon EF-S 10-22mm lens at 22mm, hand-held. Exposure F8 at 1/200 sec. Original image in Raw format.